They say the best gifts come in small packages, but when that package is delivered in the mail almost eight years after it was written -- and two years after the person sending it has died -- it is truly special. Little Rowan Torrez was only 7 years old when his dad, Joseph Torrez, died from an incurable neurological disorder called Creutzfeldt-Jakob disease. Fortunately, Rowan now has a much happier final memory to remember his dad. On March 7, just days shy of the second anniversary of his death on March 13, 2013, the little boy received a postcard in the mail that his father had written him on June 10, 2007. “It was extraordinary enough that it arrived, and then the timing of when it came -- it’s just crazy,” said Van Stone, 39. Friday will be exactly two years since Rowan lost his daddy. Rowan, now 9, remembers always getting to visit his dad in exotic locations while he was stationed in the Navy. 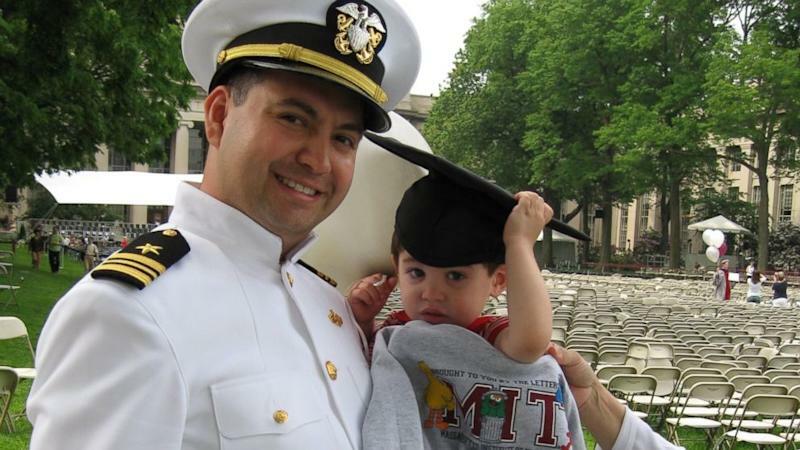 Torrez loved his son so much he made the difficult decision to leave his family in Littleton, Colorado, to join the Navy while earning two masters degrees from MIT, all in order to better provide for them. This postcard is just a continuation of those good times. Right after Torrez graduated from MIT, he was driving from Boston back to his family in Colorado, apparently sending Rowan postcards from each state he stopped in along the way. Van Stone recalls her husband asking, “Did you get my postcards?,” to which she replied, “We got three or four.” She vaguely remembers him mentioning that he had sent more along the way, but the family just assumed they had gotten lost in the mail. Now, nearly eight years later, they know. Torrez’s last words he ever spoke to Van Stone still resonate with her to this day, now more clearly than ever. She and Rowan can rest assured he was right.